Vintage Articles-US Open and S.I. 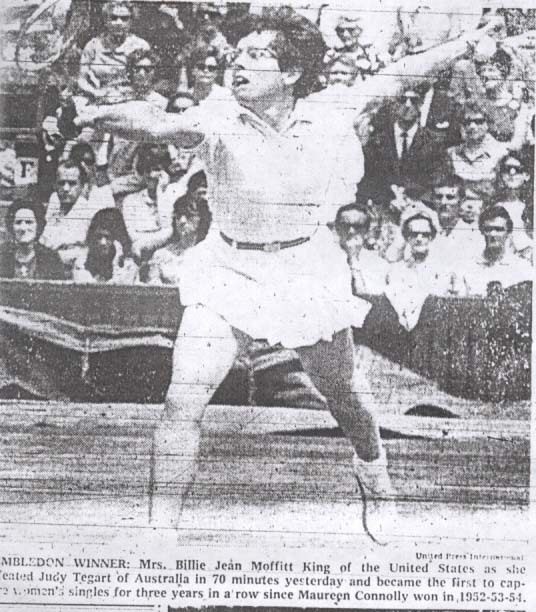 Mrs. Billie Jean Moffitt King is still queen of Wimbledon. The bestpectacled Californian, wan and listless most of the way, won her third title in a row on raw courage and some knifing volleys in beating seventh-seeded Judy Tegart of Austrailia, 9-7, 7-5 over 70 minutes on the center court today. Mrs. King seemed a pale carbon of the exuberant extrovert who set tennis aflame here a few years back. Wise of grin and brash of manner, she made history in 1962 by bouncing out the favorite, Margaret Smith (now Mrs. Court) in the first round. The public loved it. The "Moffitt Mob" would hem in the sidecourts to hear as much as watch her. "Thrown in your nickles and dimes, " she would say. "this is the worst show on earth." Mrs. Ann Jones ended today the three-year reign of Mrs. Billie Jean King as Wimbledon women's tennis champion. The 30 year old British left hander a dogged competitor, won by 3-6, 6-3, 6-2 in 70 minutes before 15,000 excited fans jammed around center court. Some of the fans had yelled, "Out! Out! at close line calls and at one point the yelling prompted Mrs. King to curtsy to the crowd. "The crowd was making the calls before the balls hit," Mrs. King said after the match. "The curtsy was a nice way of saying be quiet." "I wanted to win fair and square," Mrs. Jones said. "I did not want the crowd to put Billie Jean off. I felt slightly embarrassed about being in England. I anted to win, but I wanted to win fair and square." 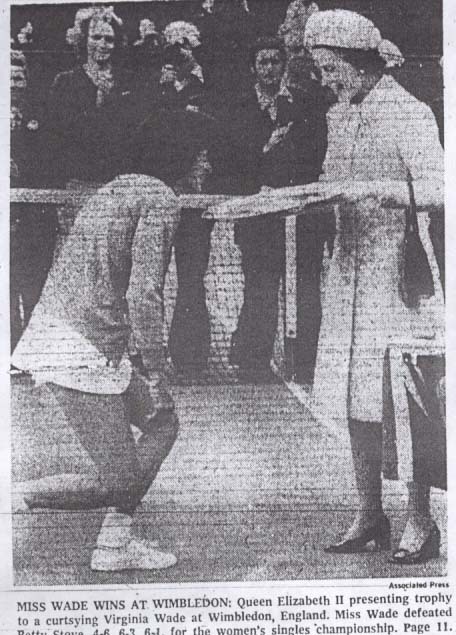 Mrs. Margaret Court won her third All_England tennis title at Wimbledon today. The great Australian defeated Mrs. Billie Jean King, 14-12, 11-9, in a battle that raged 2 1/2 hours and left the windblown crowd on center court drained on emotion. It was the longest women's final in 21 years. Since Louise Brough beat Mrs. Margaret Osborn du Pont, and it ended with a crescendo of drama as Billie Jean, hobbled by leg cramps and unable to go to net, hit five shots of outrageous imagination to save as many match points before the last ball dribbled weakly into the net. Mrs. Court too, had her physical troubles. Before she went on court, she took pain killing injections for the torn ankle ligaments sustained in a Monday match with Helga Neissen. "Whether I would have lasted three sets, I don't know. When I came off court in the end, I had a cramp in the ankle quite badly," she said. 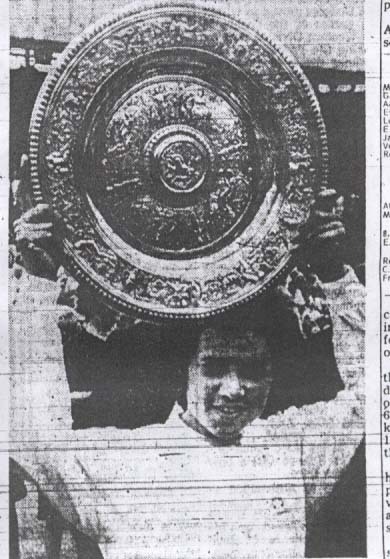 Evonne Goolagong won at Wimbledon today. The 19 year old daughter of an Autralian aboriginal sheep-shearer won the All England women's tennis championship on the storied center court by defeating the great Mrs. Margaret Court. The margin by which she destoyed her 28 year old Australian opponent defies belief. With a four game burst at the start and a streak of six games in a row to end it, the amazing youngster won by 6-4, 6-1 from the three-time Wimbledon champion who has taken more major titles than any other woman. Mrs. Billie Jean King won from Rosie Casals to reach her seventh Wimbledon tennis final today. 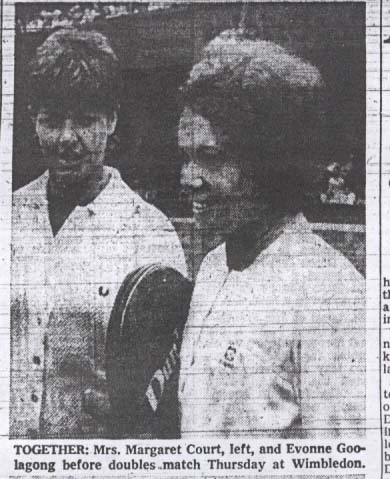 Then Evonne Goolagong and Chris Evert came on the court for the long-awaited meeting between the 20 year old Australian who cavorted to fame by winning the title last year and the 17 year old marvel from Fort Lauderdale, Fla., who had a streak of 26 victories to Forest Hills last year and 12 in her baptismal in England. It was all it had been billed to be-a wildly fluctuating match that raged over the center court for 100 minutes before Evonne won, 4-6, 6-3, 6-4. It was a contest between the instinctive genius and natural flair of Evonne and the imperturbable mien and copybook style of young Chris. And if it was loosely played in the early stages, it smoldered into flame midway through and erupted in those last heart-tugging moments into the great match of this Wimbledon. More concerned with the swirling wind, Billie Jean King had accepted several questionable calls witha silent stare or a shake of the head. But now, in the seventh game of the first set in her Wimbledon's women's final today, she uncoiled in her see-through dress and swatted a serve to Evonne Goolagong's backhand. Chalk dust rose in a puff as the ball skidded off the worn brown grass for an apparent ace. "Out," called the linesman, firmly. "Hey," Billie Jean shouted, annoyed. Had it been ruled an ace, Mrs. King would have held her serve for a 5-2 lead. Instead, in her annoyance, she lost that game. But quickly, she regained her poise and concentration. Another player might have collapsed. But despite the Australian's 40-15 lead in the next game, Billie Jean rallied to break serve. In her moment of truth she not only had survived; she also had conquered. And she was on her way to a 6-3, 6-3 victory or her fourth Wimbledon singled title. "I had some bad calls," she said later, "but Rod Laver and Ken Rosewall once told me to expect five or six bad calls in a match before I get upset. but they'd already called three or four on me. " Billie Jean King trounced Evonne Goolagong Cawley, 6-0, 6-1, in just 39 minutes today to win what she says will be her last major singles tennis title and to leave Wimbledon in a blaze of glory. "What a way to end my career," she said happily. "It's as close as I've ever come to a perfect match." Chris Evert has won the All-England tennis title for the second time. In a nailbiting final that raged over 2 hours on center court, the 20 year old No. 1 seeded player rallied to take three games running and the match from archrival Evonne Goolagong 6-3, 4-6, 8-6, for the first American title at this sunniest of Wimbledons. "It was a battle of the minds, a question of who was going to hang in longest and who was going to rise to the occasion," said Miss Evert, who was beating the Australian for the first time on grass. "I never gave up. I just tried to stay in there-to guts it out." They waved the Union Jack, cheered wildly and sang "For She's a Jolly Good Fellow." The Duchess of Kent held her arms high in the royal box. And in the middle of the madness, Queen Elizabeth II praised Virginia Wade for winning Wimbledon today and said, "It must be hard work." It was. Miss Wade had kept her eager subjects waiting and nervous. 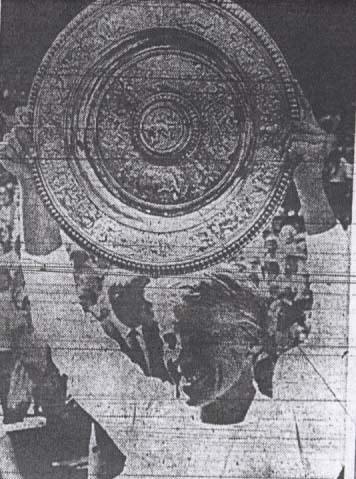 She lost the first set of the women's singles final to Betty Stove of the Netherlands and lingered close to the brink at 3-all in the second before winning nine of the next 10 games and the match, 4-6, 6-3, 6-1, for her first Wimbledon singles crown. Martina Navratilova, who left her parents and homeland three years ago in pursuit of freedom, won the women's singles title at WImbledon today in a courageous three-set comeback victory over Chris Evert. In a match filled with the same drama that accompanied Virginia Wade's triumph during last year's cnetennial championships, the 21 year old Miss Navratilova rebounded from the loss of the first set and deficits of 2-4 and 4-5 in the third for a 2-6, 6-4, 7-5 victory. As a final backhand volley landed for a winner on the soft grass court of the stately all England Lawn Tennis Club Miss Navratilova could hardly believe that she had won the crown she said she hand tought about since she was a schoolgirl in Czechoslovakia. She raised her arms triumphantly , put her hands to her face and shook her head in disbelief as tears welled in her eyes. Martina Navratilova, the Czechoslovak tennis star who defected to United States four years ago, won her second consecutive title today in the women's singles of the Wimbledon Lawn Tennis Cahmpionships. 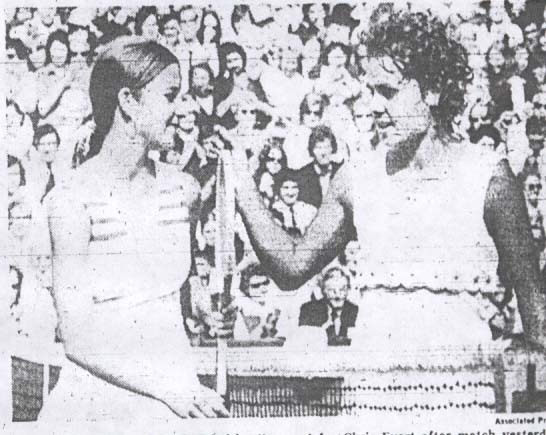 In the presenceof 13, 600 hushed spectators, Miss Navratilova accepted the silver-gilt trophy from the Duchess of Kent. Then she blew a kiss to her mother, whom the Czecholsolvakia government had permitted to come here on a two week visit. Her mother was sitting nearby in a box at court level. "One more time," Miss Navratilova said to her. 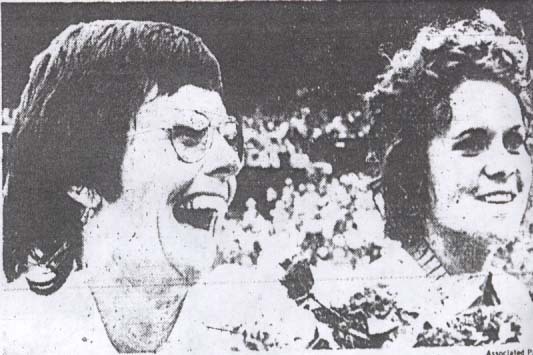 In the late afternooon gloom of center court, as the flashbulbs blinked, a misty rain mixed with Evonne Goolagong Cawley's tears on her radiant face. Like so many WImbledon champions before her, she barely heard the words of congratulations as the Duchess of Kent presented the winner's trophy, but when the Duchess turned to applaud Miss Goolagong's husband in the stands, the new champion turned on a wise smile.